According to 411 Mania and Fightful (originally reported on PWInsider Elite), the Circuit Court of Cook County in Illinois has dismissed the first of two allegations against CM Punk. This is in concern to the lawsuit that was filed by 'former' friend Colt Cabana. The original lawsuit alleged that CM Punk (Phil Brooks) refused to pay Colt Cabana's (Scott Colton) legal costs in relation to the Chris Amann case. Cm Punk and Colt Cabana have/had been friends for many years. Colt Cabana runs a successful podcast 'The Art of Wrestling', which featured CM Punk as a guest soon after he left WWE in 2014. During the podcast, CM Punk alleged that the WWE doctor, Chris Amann, had misdiagnosed a staph infection. In response to the allegation, Chris Amann filed suit against CM Punk and Colt Cabana for defamation. 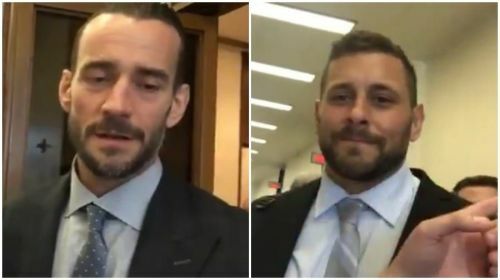 The lawsuit was eventually dismissed last year but Colt Cabana sued CM Punk after alleging that CM Punk offered to pay his legal fees and didn't do so. The first lawsuit was dismissed and Colt Cabana filed an amended lawsuit in December 2018. According to 411 Mania, as reported by PW Insider, the judge in the case dismissed the first count of allegations of fraud against CM Punk as of March 15th. Colt Cabana had originally claimed that Punk knew or should have known that he didn't intend to cover his share of the legal fees in the Chris Amann case. However, for the second charge, the judge ruled that while the text message from CM Punk to Colt Cabana which read '100 % covered' didn't constitute an enforceable contract, CM Punk's attorney's email to Colt Cabana which offered to cover Cabana's expenses in the lawsuit could constitute a potentially-enforceable contract. In short, the second allegation, which relates to breach of contract, is moving forward and the court will rule whether it is legally viable. Discovery of the case is moving through May 7th, and there will be a case management conference on May 21st. CM Punk Rumors: Major backstage details emerge...confirming former WWE Superstar's return to the ring?